When you think of frozen foods, you probably think of those plastic bags containing mixed vegetables (that probably aren't even in season) and plastic covered meats you stuff in the freezer. Let me start off by saying that my freezer (at the moment) does have these items in them. I live with my folks, and I can't necessarily control what they buy (though I do make plastic-free suggestions where appropriate). Still, I've noticed a shift: My mom is starting to feel more and more comfortable with the idea of freezing food without plastic. On Sundays when she makes her delicious pasta sauce, she always reaches for a mason jar first to store the leftover sauce, then freezes it. I'm proud of her for that. She's done that with more than just sauce too: Soup, broth, chopped vegetables. All because I taught her how to freeze food without plastic. And honestly, it's really not that hard. By far, glass jars are the best containers for freezing food. Glass is impermeable, meaning no staining or stink. Glass also won't leach toxins into your food like plastic does, plus it's 100 percent recyclable (unlike plastic, which is super complicated to recycle). Last but not least, glass looks nicer in my eyes (yes I'm biased). But with all those benefits aside, there is one concern that looms in the background: Glass can break. I want you to know it's okay not to be perfect right off the bat. It's okay to ease into this. Many of my followers have expressed their fear of breaking a jar - for some, it's the whole reason they haven't tried to freeze food in mason jars. That's completely normal and let me just say: It might happen. I won't sugar coat this because I speak from experience (one of my jars did break). But I promise the chances of breaking one of your jars is slim, especially if you follow my tips and tricks carefully. Here's how to freeze food without plastic (and prevent it from breaking). What kind of glass jars should I use? Honestly, almost any glass jar will do. I do recommend mason jars of course, but I use a lot of emptied jam jars and coconut oil jars to get the job done. My biggest recommendation is to only use jars with a wide mouth. Meaning, don't use anything with a narrow mouth (like a wine bottle). The jars pictured in this article are good examples of what you should be using - wide mouthed jars with straight sides all the way up to the top. What can I freeze in glass jars? Practically anything! You can freeze both liquids (sauce, broth, soup, smoothies, etc. ), and solids (cut up fruit, vegetables, beans, crackers, bread, etc.) in glass jars. Another good idea is to save any food scraps in glass jars and freeze them for later - you can use them to make veggie stock. I really want to freeze some spring and summer foods this year so I have them throughout the winter too. Seeing as I like to eat seasonal, I don't buy too many things out of season (especially plastic covered spring/summer fruits). Having frozen fruits and vegetables from the warmer months in glass jars will make my life so much more pleasant come fall and winter. How do I freeze liquids (sauce, broth, soup, smoothies, etc.)? Leave enough headspace for frozen liquids to expand - This means do not fill your jar to the brim! Leave at least 1 inch, if not more, with negative space. You don't necessarily have to measure it out, but use yours eyes. If you see there's not much room left in the jar, stop and transfer some of the contents over to another jar. I usually use several (at least four) mason jars to freeze liquids, which means I don't have to worry about overloading any of them. Let the liquid cool down before putting it in the freezer - If you're storing a hot liquid in a glass jar, let it sit out for a little bit with the lid off. I usually just leave mine on the counter so it can cool down. I do this because glass is extremely sensitive to temperature. There's a possibility that it could break if I just stuck it in the freezer immediately. That said if you're freezing something cold (like a smoothie), feel free to plop it right into the freezer. Take out your glass jars from the freezer several hours before intended use - You won't be able to get the contents of your jar out until it thaws (trust me), so you'll definitely want to give it plenty of time to defrost. Do NOT expose a glass jar to warm/hot water after taking it out of the freezer. As I mentioned earlier, glass is very sensitive to temperature change, and this could cause breakage. I usually just let my jars sit on the counter or on a plate as they thaw out. If I know I want to use them for dinner or lunch, I take it out in the morning so it has a few hours to thaw out. How do I freeze solids (cut up fruit, vegetables, beans, etc.)? Beans: If you're freezing beans, you can freeze them with or without liquid (it depends on the recipe you want to use them in). If you freeze them with liquid, just be sure to treat it like a liquid and leave enough room for it to expand. Otherwise, you can freeze beans just as they are. Feel free to pre-cook them too, so you can use them on the spot later. Cookies, crackers and bread: Believe it or not, all of these can be frozen for pro-longed storage. Just get a large wide mouth jar to fit it in - bread may need to be stored in a cloth produce bag, or cut up in order to fit inside a jar (just make sure you can get it out once it's frozen). Fruit: A lot of people like to buy frozen fruit to put in their smoothies, but why do that when you can just buy package free fruit and freeze it yourself? I recommend going to the farmers market and using produce bags to put all your fruit in. For berries, my farmers market just leaves them out in a paper carton that I'm allowed to bring back the next week. They also give me a little net (which is returnable too) to make sure the fruits don't fall out of the carton in my tote bag. This summer, I plan on freezing some of the fresh fruit I get from the market: All I need to do is cut it up, place it in glass jars, put the lid on and put it in the freezer. Done and ready for the winter months! If you want, you can also place things like berries and grapes on a big baking sheet, stuff it in the freezer, and transfer the berries and grapes over to jars once they're frozen. Also, if you like to use lemon or orange zest in your recipes, you can freeze that too in a little jar - it's great when used in baking. Fruit cores and peels: Believe it or not, these can be made into scrap vinegar (Zero Waste Chef has a fantastic apple scrap vinegar recipe if you're interested). You can also freeze fruit cores and scraps when you don't have enough room to fit them in your compost pail (I speak from personal experience). Vegetables: Want to swap out those frozen veggies packaged in a plastic bag? Just freeze fresh seasonal produce instead! This summer, I'm definitely going to grab extra peas, carrots, cauliflower, broccoli and corn to make frozen mixed vegetables. All you have to do is cut up the vegetables, put them on a baking sheet, and stuff them in the freezer. When they're frozen, you can just add them to glass jars and store them in the freezer. Vegetable scraps: Don't let vegetable peels go to waste! Instead, save the ends of green beans, carrots, onions and celery to make vegetable broth. 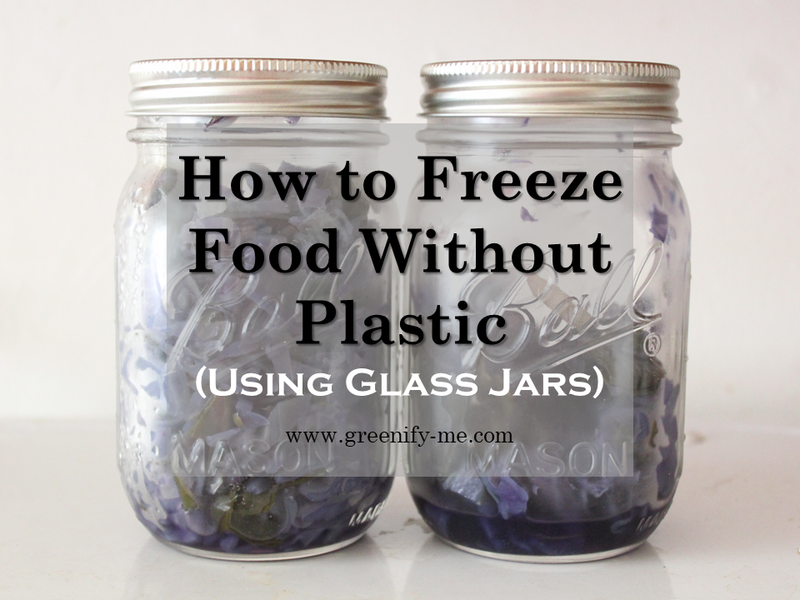 Just throw the scraps into glass jars and keep them in the freezer, adding to it over time. When you feel like you have enough scraps, make the broth by simmering it in water. Strain it and use it immediately, or pour it into another glass jar and store that in the freezer (be sure to leave enough headspace if you do this). When you're done using the food scraps, be sure to compost them. Meat: If you're a carnivore (or omnivore), consider getting your meat from a local butcher who will be happy to put your meat into glass jars. Just ask them to cut it up and hand them your jar so they can place it inside. Once you bring it home, just place it in the freezer with everything else. You can also freeze any bones leftover to make homemade bone broth. How do I prevent glass jars from breaking? I've pretty much covered this topic throughout the post, but here are a few tips to keep in mind. Only use glass jars that have wide mouths - never narrow mouths (like wine bottles) for freezing. Leave enough room for liquids to expand - leave about 1 inch of headspace, if not more. Never expose a frozen jar to warm water - Or a hot mason jar to cold water/air. Glass is super sensitive to temperature changes! Leave space between jars in the freezer - For some reason, glass jars that are touching when placed in the freezer tend to break more easily. Don't overload your freezer with mason jars - The last thing you want is to open the freezer door and have a glass jar fall out. Handle with the utmost care and respect - You want your jars to last a while, so no rough housing allowed! How do you freeze food without plastic? While it's perfectly safe and wise to reuse condiment and other jars for refrigerator and cabinet storage, it's usually discouraged to use them in the freezer, as they are not designed to withstand extreme temperatures. It's better, IMO, to stick with specifically designated canning jars (Ball or Mason brands, mostly). These are also oven-safe and can be boiled, so they are ideal for preparing single-portion meals in a ready-to-go container. I'm so happy you got something out of it James! :) Thanks for the feedback.